"Then We made thee on a shari'ah (law) about the affair (religion), then follow the shari'ah, and do not follow the desires of those who know not." [QS. Al-Maidah (5): 18]. "God has ordained (set) for religion as you about what has been bequeathed to him." [QS. Ash-Syuuraa (42): 13]. While the meaning of the term in accordance with the Shari'ah is "maa anzalahullahu li 'ibaadihi minal ahkaami' Alaa lisaani rusulihil kiraami liyukhrijan min dayaajiirizh zhalaami time ilan achievement yahdiyahum Lash wa bi idznihi shiraathil mustaqiimi." That is, the laws (rules) that Allah revealed. through his apostles were precious to humans, so they came out of the darkness into the light, and get directions to the right path. If you add the word "Islam" in the rear, so the phrase Islamic law (al-syari'atul islaamiyatu), notching terms this means, "maa anzalahullahu li 'ibaadihi minal ahkaami' Alaa Muhammad lisaani sayyidinaa 'alaihi afdhalush shalaati was salaami Sawa Akaa -un bill qur-ani am bisunnati rasuulillahi min qaulin fi'lin au au taqriirin. "that is, Islamic law is the law rules) that Allah revealed. to mankind through Prophet Muhammad. both the Qur'an and the Sunnah of the Prophet tangible words, deeds, and resolution, or confirmation. Sometimes the Islamic Shari'ah also meant to understanding Islamic jurisprudence. So, the general meaning, but the meaning of a particular sense. Ithlaaqul 'Tammi wa yuraadubihil khaashsh (generally called when a special purpose). Science of Tawheed, the laws or regulations relating to the basics of Islamic religious beliefs, which should not be questioned and should really be our faith. For example, rules relating to the Essence and Attributes of Allah. which must be faith in Him, faith in His Messengers, His angels, His books, and faith toward the end of the day including pleasure and torment, and faith in the Qadr is good and bad. Studies have also called Tawheed Ilmi Kalam creed or science. Moral Science, the regulations relating to education and improvement of the soul. For example, all the rules that lead to the protection of virtue and prevent evil-evil, as we have to do right, must fulfill the promise, to be trustworthy, and are prohibited lying and betrayal. Fiqh by language is to know or understand something. It is as stated in Surah An-Nisa (4) verse 78, "Then why did those people (hypocrites) scarcely understand speech (lessons and advice given)." Prophet Muhammad. said, " Whoever Allah wills good, then God will memahamkannya in religious matters." The word Faqiih is a term for someone who knows the laws of Personality 'relating to the actions of mukallaf, the laws were taken from their arguments in detail. Fiqh is the science in accordance with the terms of the laws of God for the actions of those obligated, legally or illegally, and it shall be so. The goal is to be able to distinguish between mandatory, illegal, or can be done. Fiqh is taken by way of ijtihad. Ibn Khaldun wrote in his Prolegomena, Fiqh is the knowledge of God's laws, in the works of the mukallaf (under the law) as required, unclean, sunnah, IT IS, and permissible. The laws were taken from the Quran and Sunnah as well as from sources other proposition that God Almighty. When laws are removed from the dali-law, the so-called Fiqh. The Salaf (predecessor) in issuing the laws of the arguments above results are different from each other. This difference is a must. Because, in general, the arguments are of texts (text base) Arabic wording-lafazhnya (words) show the meaning of disputed between them. Worship section, ie a section discussing the laws that are used to draw closer to Allah. and to exalt his greatness, like prayer, charity, fasting, and pilgrimage. Part ahwal Syakhshiyah (al-ahwaalu ash-syakhsyiyyatu), which is a part that talked about the laws relating to the establishment and organization of the family and all its consequences, such as marriage, dowry, alimony, divorce (talaq-Mail), the waiting period, custody of children (childcare), radha'ah (nursing), inheritance, etc. By most mujtahidin, the second part is included in the mu'amalah. Part Mu'amalah (civil law), which is a part that talked about the laws governing property property rights, contract (contract or agreement), cooperation among people such as buying and selling, leasing (Ijara), mortgage (Rahan) perkonsian (shirkah), and others who manage the affairs of the price of the object individual, group, and all had anything to do such rights and powers. Part Hudud and Ta'zir (criminal law), the part that talked about the laws relating to crimes, violations, and its legal consequences. Part Murafa'at (procedural law), the part that talked about the laws that govern the way litigate, disputes, prosecution, and ways penetapkan a demand that is acceptable, and the ways to protect the rights of a person. Part Sirra wa Maghazi (law of war), the part that talked about the laws that govern wars between nations, organize peace, treaties, documents and the relations of Muslims with non-Muslim community.Thus, Islamic jurisprudence are conceptions which are required by the Muslims to organize their interests in all facets of life, provide the basics of the system of administration, commerce, politics, and civilization. That is, Islam is not just a purely religious faith, but faith and law, religion and the state, which applies all time and any place. 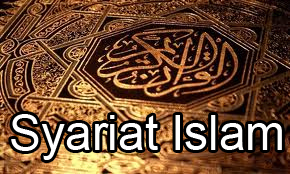 In the Qur'an there are 140 verses that specifically contains laws about worship, about ahwal syakhshiyah paragraph 70, paragraph 70 of muamalah, 30 paragraph about uqubah (penalty), and 20 verses about murafa'at. Also there are passages that discuss political relations between Islamic countries with non-Muslims. In addition to the Qur'an, the six aforementioned legal themes are also explained through the hadiths of the Prophet. Some of the hadiths strengthen the existing regulations in the verses of the Qur'an, some have elaborate because the Qur'an mentions only globally, and some mention of a law that is not mentioned malls dala-Qur'an. Thus, the function of the hadith is as a description and explanation of the texts (text) of the Qur'an that can meet the needs (certainty hukun) Muslims. Legal Personality 'is "maa bi tsabata khithaabillahil muwajjahi Laal' ibaadi 'Alaa Shalabi sabiilith since takhyiiri awil wadh'i". That is, something that has been established by the decree of God addressed to man, the establishment by way of a claim (thalab), is not an option (takhyir), or wadha '. Examples of the Islamic ruling, the direct command of Allah. "Tegakkahlah prayer and pay the poor!" [QS. Al-Muzzamil (73): 20]. This verse establishes a claim to do, in a way that shows the necessity demands mandatory law of prayer and charity. Allah says, "And do not approach adultery!" [QS. Al-Isra (17): 32]. This verse establishes a claim to leave, in a way that shows the necessity of illegal adultery law. Allah says, "And when you have bertahallul (shaving), then the hunt." [QS. Al-Maidah (5): 2]. This verse indicates an Islamic ruling can hunt after tahallul (apart from the Hajj pilgrimage). Mukallaf people can choose between doing hunting or tidak.Yang referred to wadha 'is something that is put into a cause or a requirement, or a deterrent to others. For example, the order of Allah. "Male and female thief, cut off their hands." [QS. Al-Maidah (5): 38]. This verse indicates that the theft was made because of the law of amputations. The Prophet said., " God Almighty. does not accept the prayer of the purification. "This hadith indicates that purification is used as a condition for prayer. Another example, the words of the Prophet. "The killer can not inherit anything." This hadith shows that the assassination was a deterrent murderer killed inherit the property. From the descriptions above, we understand that the laws of Personality 'is divided into two, namely law and law taklifi wadh'i. Taklifi law is something that shows the demand to do, or demands to leave, or may choose between doing and leave. Examples of laws that showed demand to do: " Take alms of their wealth!"[QS. At-Tawbah (9): 103], "Doing the Hajj is a duty men owe to Allah, for the people who can afford the journey to him." [QS. Al-Imran (3): 97]. Examples of law that demands to leave: " Let the one among you who make fun of other people ." [QS. Al-Hujurat (49): 11], "Forbidden to you dead meat, blood, and pork." [QS. Al-Maidah (5): 3]. Examples showing the law may choose (easy): " When the prayer is ended, then disperse in the land. "[QS. Al-Jumu'ah (62): 10], "And when you travel through the earth, then why do not you shorten the prayer." [QS. An-Nisa '(4): 101]. Law wadh'i is a show that has been made because the whole hog, conditions, and seminal '(prevention) for a case. For example: " O ye who believe! When ye prepare for prayer, wash your faces and your hands up to the elbows ." [QS. Al-Maidah (5): 6]. Will prayer is the ablution diwajibkannya. Examples of conditions: " Pilgrimage is a duty men owe to Allah , that is for people who can afford the journey to him." [QS. Ali Imran (3): 97]. Ability is a requirement mandatory pilgrimage. Example seminal '(prevention): Prophet. said, "Pena was appointed (not written them) from three people, from the bed until she woke up, from young children to old age, and from a madman until he recovers (understanding) . "This hadeeth indicates that nuts are a deterrent to the imposition of a legal and be a deterrent to illegal acts. Taklifi divided into two, namely azimah and rukhshah. Azimah is an original law that has not changed for a reason and an excuse. As the prayers of people in the home, not traveling. While rukhshah is an original law be changed because of a hitch (excuse). Such prayers are travelers. Haram. Haram is rather something that has been claimed by Islamic law (God Almighty.) To left with the demands of necessity. The statute is void when it is done and who does it suffers. For example, leaving the adultery charge, claims leaving eat carrion, blood and pork. Mandub (sunnah). Mandub is put to work rather than abandoned, with no obligation. Who do receive rewards, which left not a punishment, despite censure. Mandub called sunna, sunnah muakkadah (amplified) or ghairu (not) muakkadah (mustahabb). Makruh. Makruh is prioritizing abandoned than done, with no element of compulsion. For example, forbidden to pray in the middle of the road. The implementing not got a sin even if sometimes gets reproach. Permissible. Mukallaf is permissible and allowed to vote (by Allah Almighty.) Between doing something or leave it, in the sense that one does not have that advantage. For example, the word of Allah. "And eat and drink with you all." Strictly speaking, no reward, no punishment, and no censure for acts or acts dimubahkan leave. When Allah. claim to a mukallaf to do an act and the act is done in accordance with the conditions required of him with rukunnya are met, then the act is called authentic. But when one of the conditions or rukunnya damaged, then the act is called ghairush shahiih. Ash-shahiih is something that if done has consequences sequence. For example, could a mukallaf prayer perfectly, rukunnya conditions are met, he shall have fallen obligations and liabilities. Ghairush-shahiih is something that does not have the consequences of Islamic law. For example, a mukallaf prayer rukunnya conditions are not met, such as prayer without bowing. Mukallaf obligation to pray is not the fall. Similarly, if the prayer is not done on time or do without ablution. The acts done not in accordance with the demands of Allah. considered to be absent or not working on anything.